Best Ever Green Bean Casserole | For the Joy of Life. 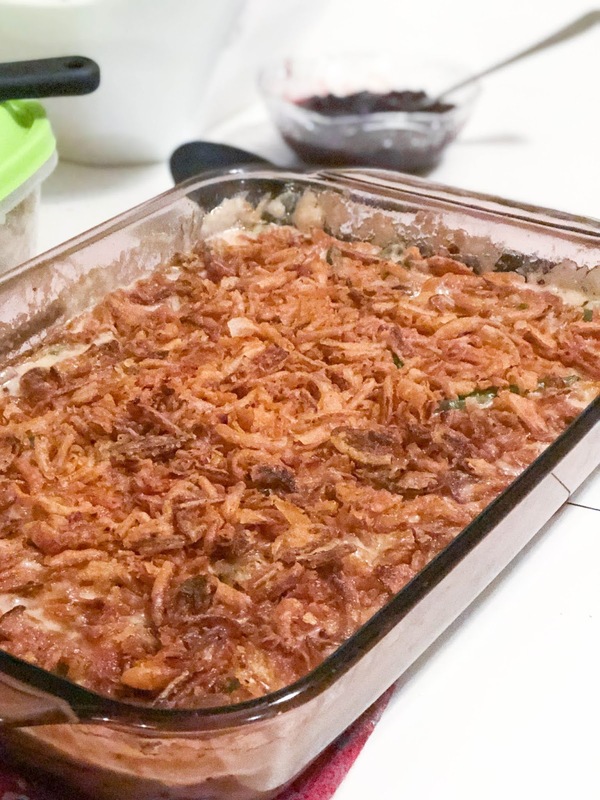 So, I know most people say their favorite part about Thanksgiving is the mashed potatoes, the rolls, maybe the stuffing... but seriously the green bean casserole is SO overlooked. It has actually always been my favorite. I just love that combination of flavors. Last Thanksgiving, I made it the traditional way... you know, cream of mushroom soup, salt and pepper, canned green beans, all that normal stuff. As I was making it I kept thinking how much better it would be from scratch. How much better it would be with sautéed mushroom, fresh green beans, real garlic... I was literally salivating thinking about it. So, for Christmas I decided to attempt it and will literally never look back. Now don't get me wrong, just because you're using real ingredients rather than canned, does not mean it makes it any healthier, ha! 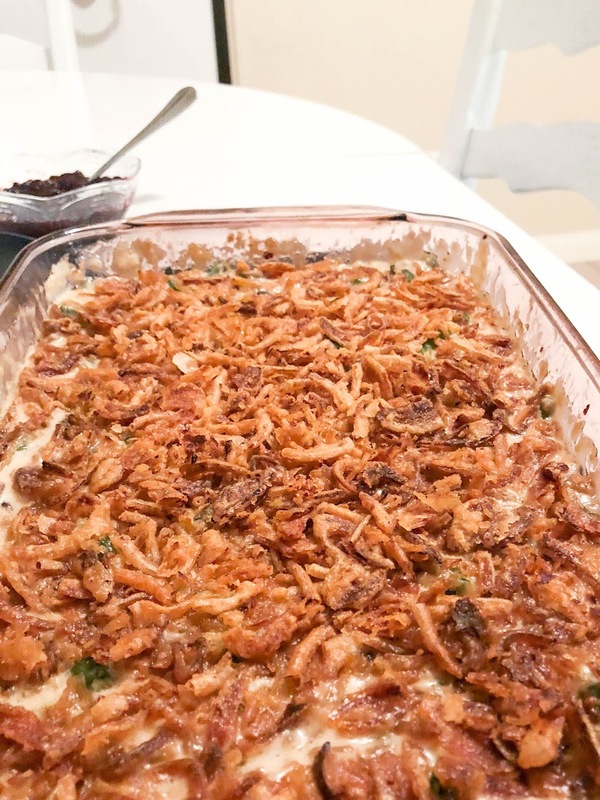 But I can promise you, you'll never overlook the green bean casserole again! Also, you'd think that one of my favorite recipes would get better pictures... you'd think.... But, we were rushing out the door and I completely forgot until right before we were dishing up at a recent Friendsgiving. So, here's some mediocre iPhone pictures that will just have to do for now haha. 1. Preheat your oven to 400 degrees. Grease a 9x13 baking dish. Boil a large pot of salted water. 2. Wash your green beans. Cut off any stems left on them. Cut them in half. Once the water is boiling, add them in for 7-10 minutes or until you've reached your desired consistency. Please, I beg you, just don't let them turn to mush! 3) In a medium saucepan melt 4 tbsp of butter. It melts best if you cut it down into 4 pieces. Just make sure you stir it while melting so it doesn't burn. Once it's melted add in your garlic and give it a good few stirs or until the garlic becomes very fragrant. Whisk your flour in to form a roux and continue to whisk until completely smooth. 4) Slowly pour in the chicken broth and whisk until combined. Let that cook for another 5 minutes. 5) Pour in milk and cream and whisk until combined. Add in salt and pepper to your liking. I like to add some garlic salt too. Let that thicken on medium low heat. It'll take between 10-15 minutes. 6) While sauce is thickening add your leftover tbsp of butter to a small pan and let that melt. Add in your mushroom and onion and sautee until both are wilted. Sprinkle salt and pepper. 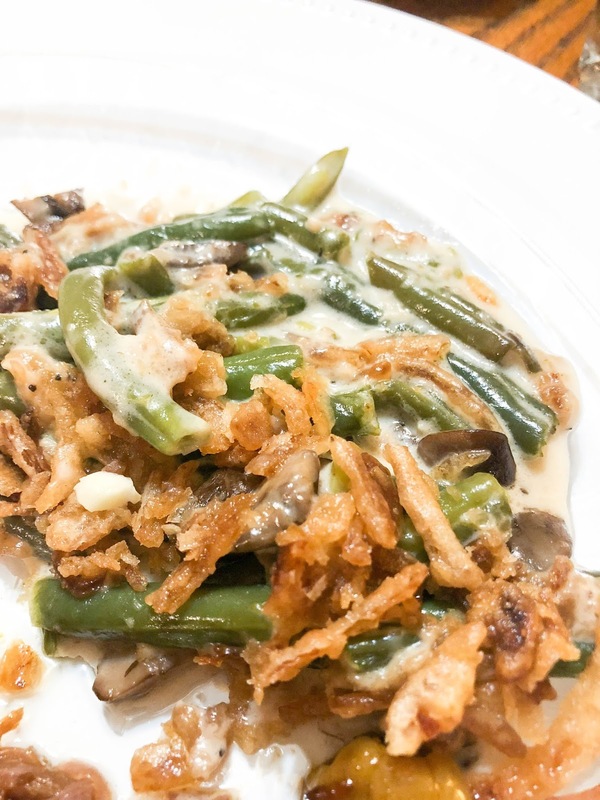 7) In your baking dish first add all your green beans in an even layer. Next add the sautéed veggies in an even layer. Then pour sauce over the top and try to evenly distribute. 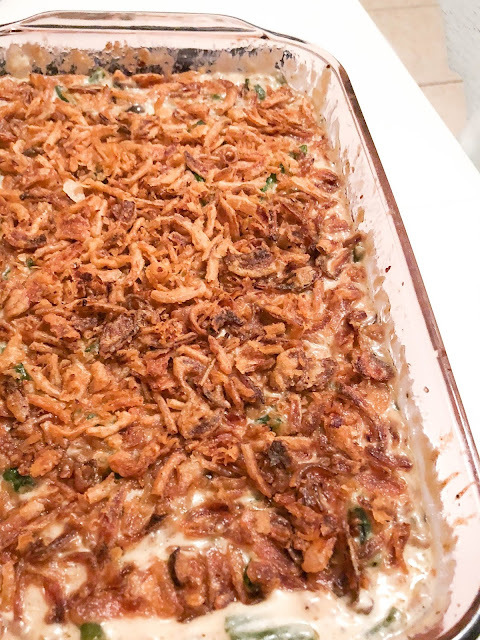 Lastly, top with your fried onions and bake for 30 minutes or until sauce is bubbling on sides and everything looks well combined. I also place a piece of foil over the top for the last 10 or so minutes so the onions don't burn. I really hope you guys love this as much as we do! Please let me know if you tried it!